This Scandi-inspired banner by Dawn Curran is a fun first colourwork project, and makes a great addition to your seasonal decor. Find this stunning patten inside the latest issue of Inside Crochet, available to order online and download directly to your smart device. 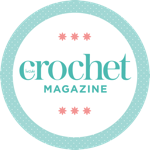 Dawn believes we all have a creative desire and hopes to help makers create items they love while developing their crochet skills. Visit her Etsy store at www.thealmondsnug.etsy.com.